An astonishing twenty years after the classic De Mysteriis Dom Sathanas, and surviving murder, burnt churches and nu-metal, Mayhem have re-emerged from the twilight to release a new album. It's a hell of an event, whether you think the band died with Euronymous, Dead, or Grand Declaration of War – Ordo Ad Chao came out an incredible seven years ago, and is still one of my favourite releases from the band. I've been looking forward to a follow-up since, despite the departure of long-term guitarist Blasphemer in 2008. And it seems that replacing Blasphemer with Teloch (formerly of 1349 and impressing me last year with the excellent Nidingr) was a good move for the band. He's an excellent guitarist, technical and sharp, and fits into the band perfectly. The overall vibe is definitely post-Ordo Ad Chao, with a beefier production and a more metal sound, as if the ghosts of Wolf's Lair Abyss and Chimera were absorbed. Yet it's far from sterile blasting, as opener Watchers proves with its little technical breakdowns, shifting from riff to riff violently, intensely blasting for a moment before a bleak tempo drop; the guitars always absorbed utterly into the backing soundscape. And as you'd expect, the other members of Mayhem are just as important – Hellhammer fans will be in heaven, the drumming is fantastic and a perfect counterpoint to Teloch's technical style. Yet Attila is the man to focus on, as ever. He isn't quite the weeping lunatic of Ordo Ad Chao here, but his black metal croak is as damaged and disturbing as ever, whether throatily gurgling, creepily whispering or outright screeching at the listener. He focuses the music wonderfully, a true frontman for the organised chaos behind him. What's even more impressive is how good the songwriting is. Watchers' structure is perfect for an album opener, seeming to build and build even as it pours chaos over you. Set in its place as the second track in the tracklisting, first single PsyWar is intense and heavy, building on Watchers' violence and focusing it into a tight blast, yet it pales in comparison to the following Trinity, which starts fast and heavy and only increases both, backing sounds of warfare perfectly judged. Posthuman is the longest track present at just under seven minutes, and carries it well, allowing Necrobutcher's bass a spot in the limelight alongside some jangly work from Teloch. It's not all perfect, sadly; MILAB is a change in tone, slowing down completely and sounding initially like Aborym stripped of all electronics before picking up the pace a little, and the following VI Sec continues in this style with a wilder performance from Attila the only thing to recommend it. As far as experiments go, they're not the worst thing that Mayhem has done, but it's still a relief to hear Throne of Time return to vicious black metal after a droning introduction, and Corpse of Care is an effectively haunting piece that touches on the avant-garde, complete with chanted vocals and mad laughter from Attila. Once Aion Suntalia has brought the album to a close with a dissonant spiral into madness, it's clear that Esoteric Warfare is no letdown, although it's not the sledgehammer impact of divisiveness that we've come to expect from the band – many will like this, but few will pronounce it godlike genius. Which is a step down for a band like this in some ways, which rode controversy into infamy back in the day but which exists as elder godfather of black metal these days, as fondly known for Necrobutcher's hilarious drunken rant on Metal: A Headbanger's Journey as their music. 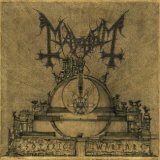 Yet Esoteric Warfare is far from a disappointment; it's a deep, worthy album that stands up to repeated listens and ensures that Mayhem still has something to say in 2014, even if it's not as good as Mayhem in 1994.